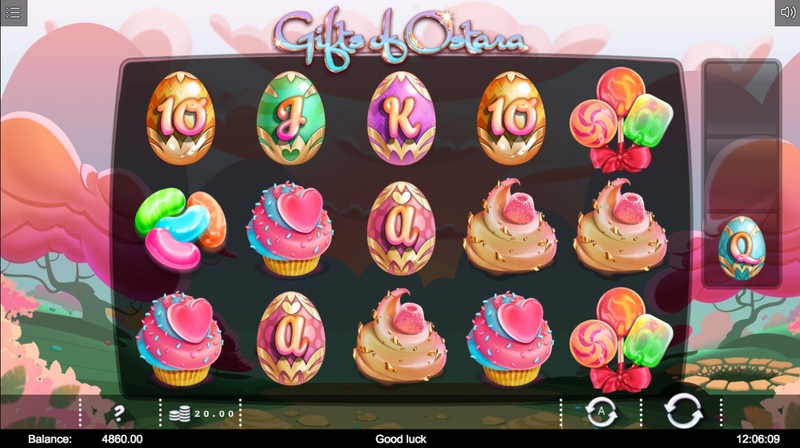 Gifts of Ostara slot is Easter-themed game from Iron Dog Studio. Unlike most slots of this theme, the developer has actually done a bit of homework and created a game around, Ostara, a Germanic Goddess who bears the same name as the festival of Easter. 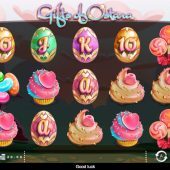 This slot game is bright and colourful and has similarities in look to candy-themed slots like Microgaming’s Sugar Parade or Playtech’s Sweet Party. So will Gifts of Ostara give our bankroll a sugar rush or will be left with a bitter taste? The background to Gifts of Ostara is forest painted in light pastel colours. On this sits the 5 reels of 3 rows, with a total of 20 paylines. Along with Easter eggs, there are jelly beans, cupcakes, lollipops and meringues. Top paying symbol is the Meringue, which pays 100x your total stake for 5-of-a-kind (5OAK), that's impressive! The typical A-K-Q-J-10 symbols are contained in the brightly painted eggs, which appear most frequently on the reels. Wild egg – an expanding Wild will appear on either reels 2, 3 or 4. Sticky Wild egg – 3 Free Spins are award with a sticky Wild held on one of the 3 middle reels. ‘X’ Multiplier egg –receive a multiplier equivalent to 2, 4, 6, 8 or 10x your stake. Silver Bunny egg – receive 1 re-spin. Golden Bunny egg – get a prizes of 30x your stake if a golden bunny hatches. Free Spins egg – Fill all 3 egg positions with the same value egg A, K, Q, J or 10 and you will trigger 10 free spins. The feature will be boosted with a multiplier, depending on the egg value: A = 5x, K = 4x and so on to 10 = 1x. Gifts of Ostara is an interesting concept on what traditionally is a bit of a gimmick theme for developers. The idea of eggs delivering rewards in not exactly a new one, as we have seen in NetEnt’s EggoMatic. However, Iron Dog have come up with something original here and I can see it having an appeal to certain players. An impressive 96.7% RTP makes this game quite enticing, but there is a definite frustration felt in trying to unlock some of the more rewarding features in this game. As Iron Dog Studio slots go, this one doesn’t match up to Blood Queen in terms of playability, however that doesn’t mean you shouldn’t go seeking out some of those golden eggs.